The Engine & Gearbox Exchange Ltd was based at Atlas Works, West View Terrace, Dunston. The directors were Florence Kelly and James Jardine and probably Mr Kelly was involved. The same team also operated Keldine Autos in Dunston. 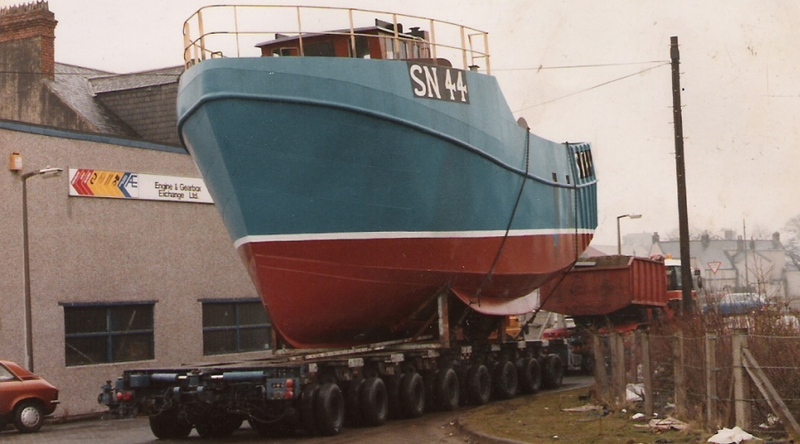 There was no direct access to the river from the works and the boats were taken away on a low loader to be launched. Rumour has it that the boats were all built from steel salvaged from gas monitors that were being demolished on Tyneside. On the other hand other sources say that this is not true and that they were constructed of new steel. Another rumour is that the hulls of the boats were built by George Crutwell (see own section). Apparently they were fitted out with reconditioned bus or lorry engines and the other equipment such as winches was also secondhand. The resulting boats were not the best boats to work on or maintain but they came at £50,000 ready for sea, much cheaper than other builders. They were probably built to Engine & Exchange's own account and subsequently sold to other owners rather than being built to order. Apparently the boats were known as 'Kelly's heroes' or 'gas tank boats' and it seems that they all had to be re-engined early in life. Thanks to Richard Potter for researching the company history.